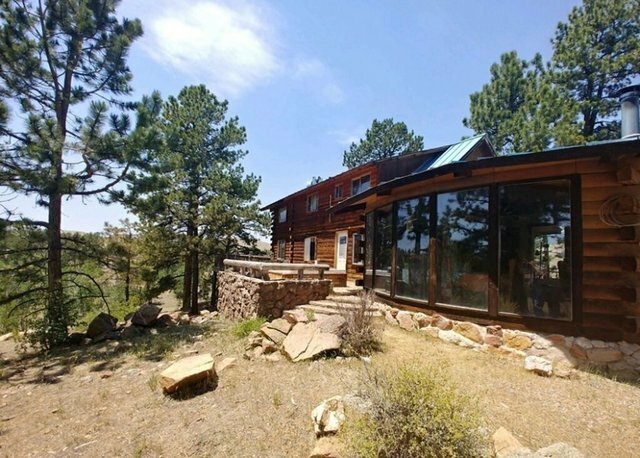 Waugh Mountain Ranch is a contemporary rustic cabin retreat comprised of 412 acres in the mountains of Colorado on the eastern side of the great continental divide. The property is located 14 +/- miles north of the riverside town of Cotopaxi, Colorado. Improvements are designed with large gatherings in mind, there is a lodge-style log home, a separate bunkhouse/guest house, calving barn, horse barn and corrals with an outdoor riding arena. Breathtaking views from the property include Waugh Mountain and Loco Mountain to the north, Green Mountain to the east and Bear Mountain with the snow-capped San De Cristo Mountains in the far distance. It is also adjacent to BLM public lands with elk, deer, bighorn sheep and many other species that crisscross the ranch and make the forests their home.